As you can see from the recipe card, I created this martini for Valentine's Day for the rich, deep red color but there is no rule that says you can only drink it in February. 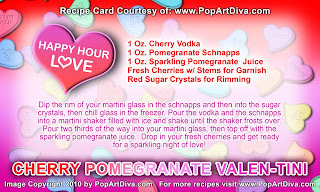 Get the full sized recipe card for my CHERRY POMEGRANATE VALENTINI HERE ALL MY VALENTINE COCKTAILS! The health benefits and history of pomegranates.